This is just yummy and a terrific weekday meal. It’s also great for a dinner party. It’s fast AND delicious; it can be a one-pan wonder. It works with any fish, but I think I like it best with a white fish, as opposed to salmon. The sauce positively sings when used with sea bass…we’re talking arias here. This recipe is simplicity itself—fish filets, tilapia, cod, halibut or any white fish works well. Sea bass is spectacularly good this way. The are simply rolled in a coating like Wondra, which isn’t gluten-free, if that’s an issue. But you can use cornstarch, rice flour or masa, which is what I used here; they are all gluten-free. 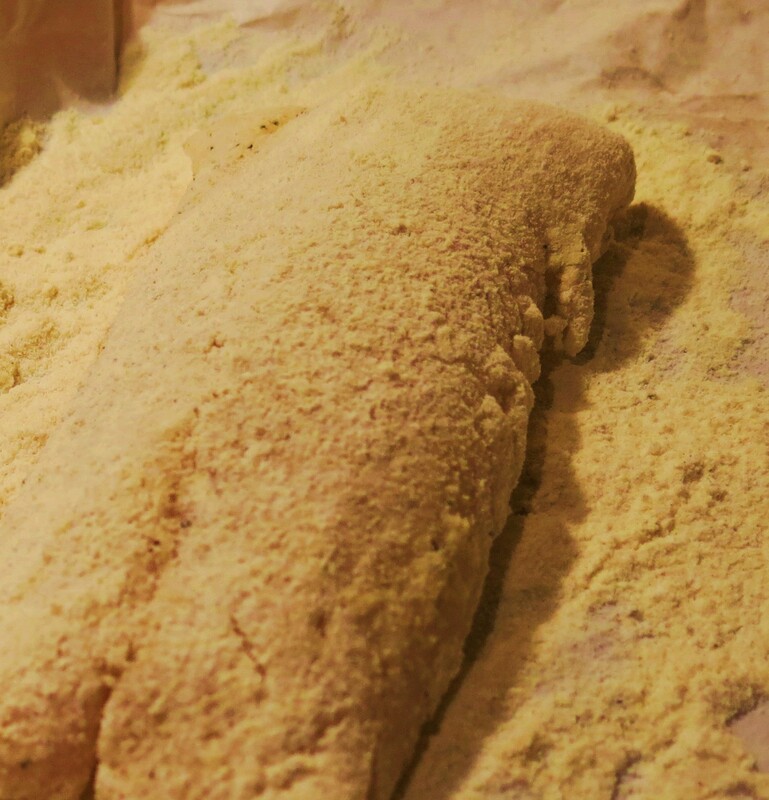 Masa is a great coating and it is particularly good as a coating for fish. It’s light, but has a nice crisp finish and browns well. The sauce is shallots, pineapple juice, heavy cream, a few drops of lemon juice, a bit of salt and pepper and that’s all she wrote. 1 pound of fish filets, such as tilapia, cod, halibut, sea bass, etc. Drizzle the fish with lime juice. Season with salt and pepper on both sides of the filet(s). Roll in whichever coating you choose just to coat it lightly. Dust with Cajun seasoning. The coating will be crispiest if you let the fish stand for about 15 minutes or longer (refrigerate if leaving for a longer period of time), after rolling in coating. Heat a cast iron skillet over medium heat. Add enough oil to coat the skillet and be around 1/8-inch deep. When the oil is hot, gently place the fish filet(s) in the pan. Do not over-crowd; it’s better to work in batches. Pan-fry for about 2 minutes or until nicely browned. Using a spatula, gently turn the fish and brown on the 2nd side, about 3-4 minutes or until the fish is barely cooked through. Remove the fish to a platter and serve on top of the Pineapple-Cream Sauce. In a medium saucepan over medium high heat, combine the shallot, white wine and 1/2 cup pineapple juice (save the remaining 1/4 cup for later). Bring to the simmer and simmer until reduced by half. Add the remaining pineapple juice and reduce the mixture to about 1/4 cup. 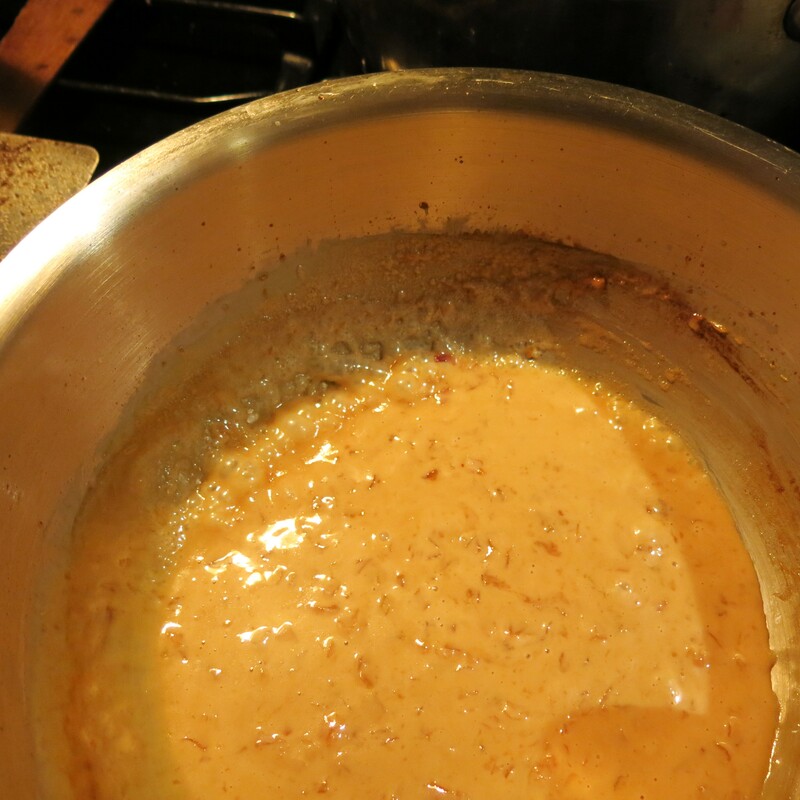 Add the heavy cream and simmer until the mixture thickens slightly, about 2-3 minutes. Season with salt and pepper. Taste and add a dash of lemon juice, if needed. NOTE: If you wish, omit the pineapple juice and use frozen pineapple juice concentrate. Add the shallots to the wine and simmer until reduced to 3 tablespoons. Add 1/3 cup frozen pineapple juice concentrate and the heavy cream. Simmer until the mixture thickens slightly. 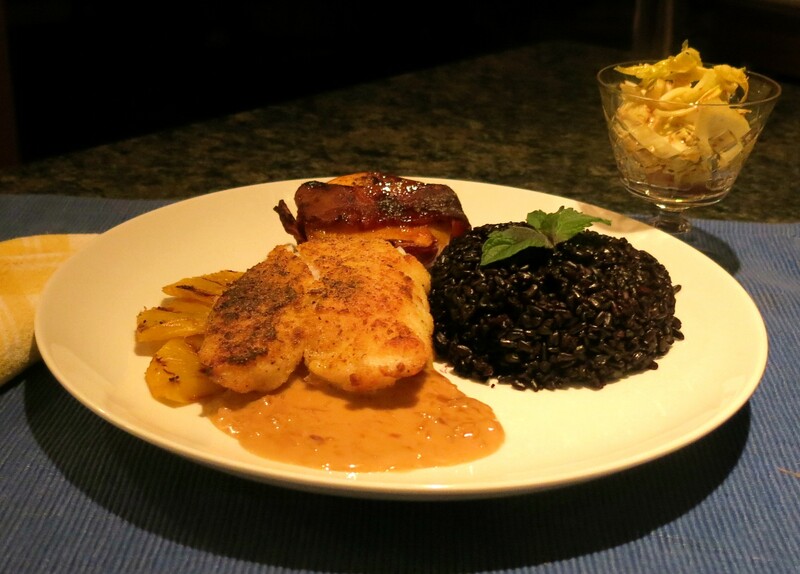 Pan-Fried Fish with Pineapple-Cream Sauce Recipe©Marcia Lahens 2015. All rights reserved. 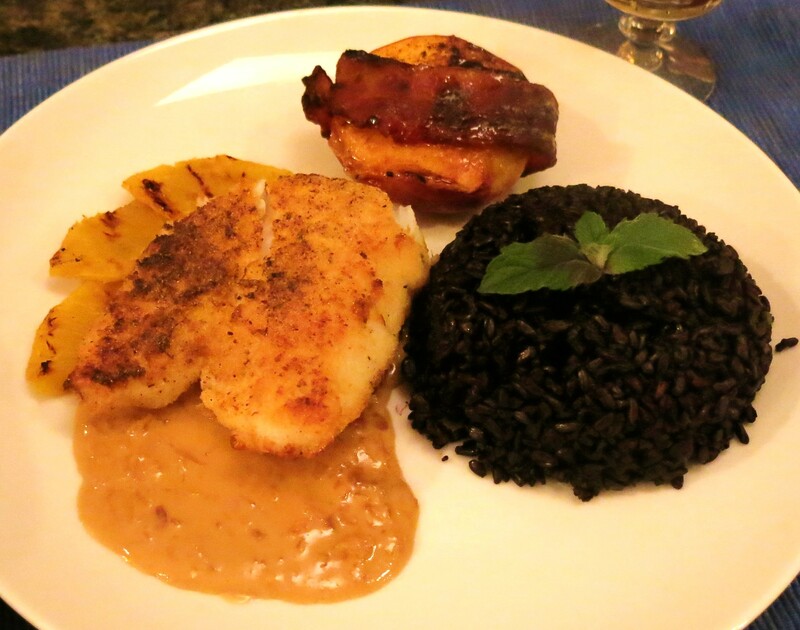 I served this with Black Japanese Rice which I cooked in a light broth, a grilled bacon-wrapped peach half (make certain to season with salt and pepper) and some grilled pineapple pieces. This benefits from a squeeze of lemon or lime juice over everything on the plate. It’s pretty and delicious. 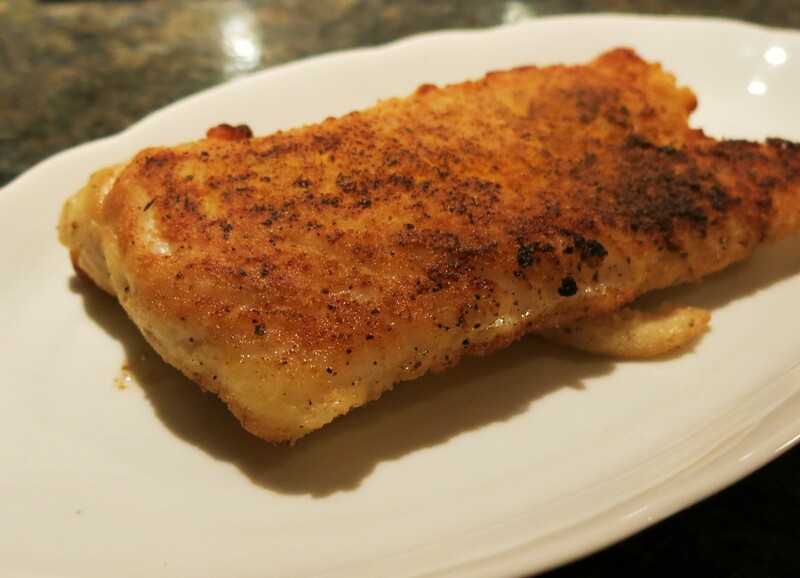 Thanks so much for posting Pan-Fried Tilapia with Pineapple-Cream Sauce on you blog. It’s always all about the sauce! Thanks again. Tried this dish the other night, and it was delicious! So glad you enjoyed. The sauce is good with salmon, as well as grilled chicken. Enjoy the summer!